According to the US Centers for Disease Control and Prevention (CDC), deep vein thrombosis affects as many as 600,000 Americans every year. If your loved one has any sort of circulatory system issues, their doctor has probably mentioned being on the lookout for deep vein thrombosis. But what is DVT, and is it something that your loved one can avoid? Commonly abbreviated as DVT, deep vein thrombosis is a clot that has formed in a blood vessel and is blocking all or part of the blood flow. 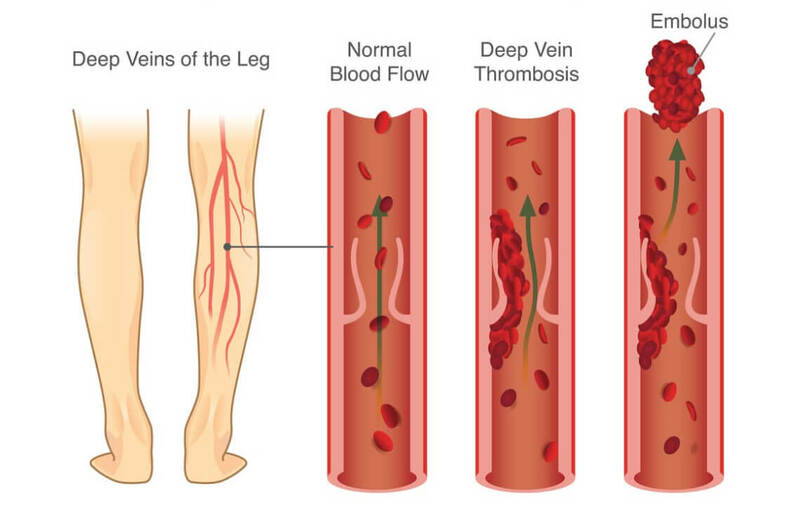 It’s called deep vein thrombosis because these clots tend to form in the veins that are located deeper in the body. Most often these clots happen in the legs, but they can also occur in other parts of the body. If the clot dislodges and travels through the bloodstream, it can reach the heart or lungs—it is then known as an embolus and if it reaches the lungs it can cause pulmonary embolism, a very serious disease that can lead to death. People who have clotting issues with their blood can easily develop DVT, but DVT can also happen if your loved one doesn’t move for a long time, like after surgery. These types of clots are dangerous because they can break free in the vein and travel through the bloodstream. Once in the bloodstream, they can lodge in the heart or lungs, causing serious damage. Swelling or pain in the affected limb can be an indication that DVT is starting to develop, but most often, there really aren’t many symptoms at all. If symptoms are present, they will usually exhibit as swelling or cramping of the leg, a possible change in color of the leg, and unusual warmth where the clot is located. If your loved one is exhibiting any of these signs and you have reason to suspect a pulmonary embolism, immediate emergency attention is required. If your loved one has previously had DVT or is a greater risk of developing it, they may be prescribed a combination of blood thinners or clot breaking medications. Your loved one’s doctor may also recommend compression stockings. These help to keep the pressure on your loved one’s legs and helps to prevent blood from collecting in their lower extremities. Age is a significant risk factor. After the age of 55, your chances increase dramatically. Limited mobility or sitting or standing for long periods of time is a risk factor. Many people correlate DVT with sitting on airplanes, but it can actually happen when engaged in any type of travel. If you are traveling for more than four hours, whether by bus, train, car or plane, you double your risk for blood clots. The best prevention is to reduce the risk factors. If your loved one smokes, it is time for them to stop. There are several agencies designed to specifically help the elderly with this important issue that affects many. Both the American Cancer Society and the American Lung Association offer information on smoking cessation programs. If they are overweight, focus on increasing fruits and vegetables in their diet and including 30 minutes of exercise at least 5 days a week in their schedule. If planning long-distance travel or your loved one sits for long periods of time, make sure they move and stretch their legs often while sitting and walk around, if possible. If they have previously experienced a blood clot, their doctor may prescribe a blood thinner before a trip or suggest compression socks. If your loved one is prescribed specific medications to prevent clots and DVT from forming, it’s essential that they follow their doctor’s instructions. They should also try to avoid lying down or sitting still for too long. Even just a few minutes of walking around the house in between periods of rest is enough to help. If your loved one is healthy enough to exercise, now is the time to help them start a solid plan. Talk to your loved one’s doctor and senior care providers about other ways to help them prevent DVT from forming. If your loved one needs assistance with the daily activities of living, consider the aid of a home care provider. These professionals can assist with bathing and dressing as well as prepare healthy meals and accompany your parent on daily walks, providing both companionship and care.